We wanted to check out a few places that looked interesting, but were rushing, on our way to somewhere else. On our way back from Harris Beach we stopped in Port Orford. 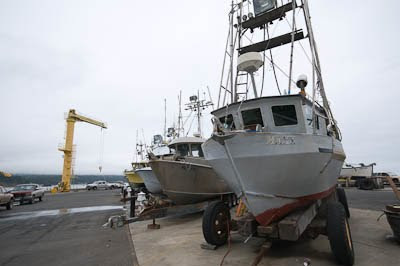 Port Orford has a unique way of harboring their fishing fleet. Every evening, because they don't have a protected harbor, they use large hosts to store their vessels on shore. There are usually lots of sea birds around, waiting for the tasty scraps. 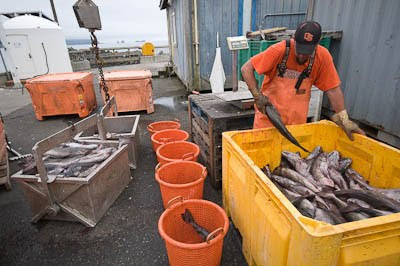 A fisherman is sorting these great looking Black Cod. 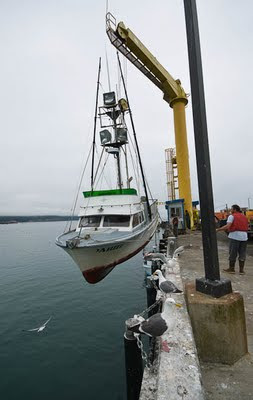 They catch quite a variety of fish here, and sell much of their catch overseas, mainly to Japan and Asia. Since they have smaller vessels, they have done some specialization for their markets.